Install all dependencies (as listed above), Sigma Dimensions and the x10.625 Galileo rescale config. Launch a new vessel into a low orbit by either conventional means or by Alt+F12 orbital editing (less than 100 km for Sigma rescales - less than 200 km for RSS or the x10.625 rescale). Observe that no Scatterer effects are visible in the flight view (map view works as expected). 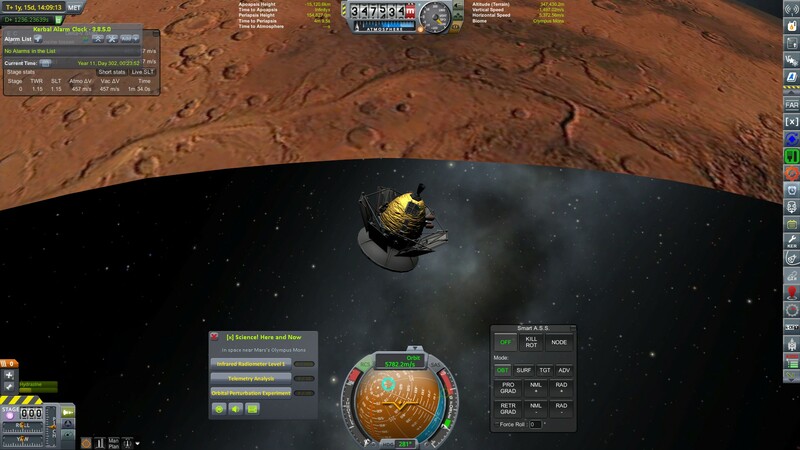 If the camera distance from the active vessel is increased at a maximum value (by scrolling out with the mouse wheel) then the effects will suddenly become visible. If the camera viewpoint is moved around, then the Scatterer effects will appear as a cube around the active vessel. It the orbital altitude of the active vessel is increased above the limits specified, then the effects will work as expected. The above issue can be also observed when using RSS (same scaling factor as the x10.625 Galileo rescale config) and any stock rescale config above x3.2. The above issue is not manifested in stock KSP or, generally, for stock rescales less than x3.2. The above issue is not manifested by using the previous v0.0320b Scatterer release. The above issue is manifested by using either the v0.0322 Scatterer release or the v0.0325 dev assembly. Various renderers (DirectX 9, DirectX 11, OpenGL 4.5) were tested. No differences between them were observed. 04:00: A sample of the "cube"
Thanks, but this has nothing to do with the sunflare. To add some details: I know what's cuasing this issue, future development on my side to improve the scaled space shaders and layer handling will fix this issue. Are you sure scatterer is causing this issue with Mars? Nope, but since it was causing the atmosphere to disappear at similar altitudes I figured it was possibly related.. I have same issue on 1.3.1KSP + RSS v13 + RSSVE 1.3.1-3 + EVE1.2.2-1 + scatterer 0.0320b just attitude differs (atmospheric effect disappear at 140000 - just when you get from atmosphere and appear at 250000... All the time for all vehicles. It appear exactly as shown on video... Is there a solution ? 0.0320b is working fine ! I finally managed to track down the change(s) that introduced the bug. It is caused by the commit a6ae4b4. When i reverted the changes in the SkyNode.cs file everything worked as expected. Tested with the latest dev Scatterer branch in KSP version 1.5.1.2335. Hi, I'm phasing out the scaled/local sky switching. Basically a permanent and elegant fix to this issue is coming in a few days. Hey, @LGhassen , were you able to fix this issue for KSP 1.3.1 version of Scatterer? This will be for a new version only, I don't support older versions but you can always recompile it for 1.3.1 if you feel up to it (may or may not be straightforward). @LGhassen I see... That is most unfortunate, as RSS-RO only runs on KSP 1.3.1, and won't be updating anytime soon. It is beyond my abilities to compile it myself, I'm afraid. I thought the point was to have the fix on 1.3.1? In case you're just looking for 0.0320b, it's there on spacedock. @LGhassen Thanks, I downloaded and installed 0.0320b. But now I'm getting dark blue sky everywhere on Kerbin... Is this a known bug? Never heard of this, I'd recommend clearing your configs and GameData folder and seeing if it persists, if it doesn't, put everything back step by step to find the issue. I really don't plan to fix bugs on any older version though, so if you find a legitimate bug unreproducible in newer versions you're on your own. The only configs related to scatterer are from RSSVE. Should I delete them? Well, I meant to remove all configs apart from stocks and as well all mods, to see if the issue persists. Can I see some screenshots of the issue? @laukejas Please take your RSSVE issues to my GitHub repository, you are not doing anyone a favor by posting them here. @LGhassen Since you have fixed the bug in the later Scatterer versions i would suggest to lock this one.